Figure A. Alexa Fluor 700 conjugated mouse anti human CD14 (MCA596A700) and RPE conjugated mouse IgG1 isotype control (MCA928PE). Figure B. Alexa Fluor 700 conjugated mouse anti human CD14 (MCA596A700) and RPE conjugated mouse anti human CD84 (MCA2123PE). All experiments performed on red cell lysed human blood gated on mononuclear cells in the presence of Human Seroblock (BUF070A). Data acquired on the ZE5™ Cell Analyzer. Mouse anti Human CD84 antibody, clone CD84.1.21 recognizes human SLAM family member 5, also known as CD84, Cell surface antigen MAX.3, Hly9-beta or Signaling lymphocytic activation molecule 5. 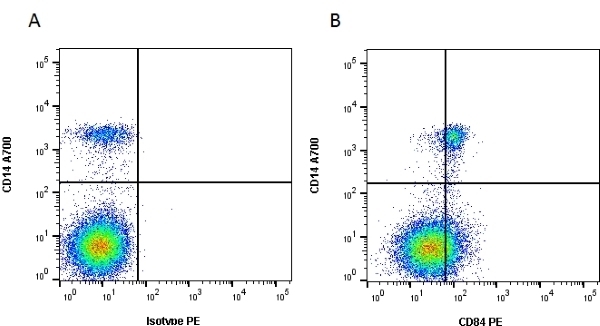 CD84 is a highly glycosylated cell surface antigen of ~64-82 kDa, predominantly expressed by B lymphocytes, monocytes and macrophages, although lower levels of expression have also been reported on T cells, granulocytes and platelets. Mouse anti Human CD84 antibody, clone CD84.1.21 has been shown to partially block CD84 homophilic binding (Moore et al. 2001). Mouse pre-B cell line 300.19 transfected with CD84 cDNA. Martin, M. et al. (2001) CD84 functions as a homophilic adhesion molecule and enhances IFN-gamma secretion: adhesion is mediated by Ig-like domain 1. J Immunol. 167 (7): 3668-76. Sayós J et al. (2001) Cell surface receptors Ly-9 and CD84 recruit the X-linked lymphoproliferative disease gene product SAP. Mihalache, C.C. et al. (2011) Inflammation-associated autophagy-related programmed necrotic death of human neutrophils characterized by organelle fusion events. Wang, X. et al. (2016) Neutrophil Necroptosis Is Triggered by Ligation of Adhesion Molecules following GM-CSF Priming. J Immunol. 197 (10): 4090-100.